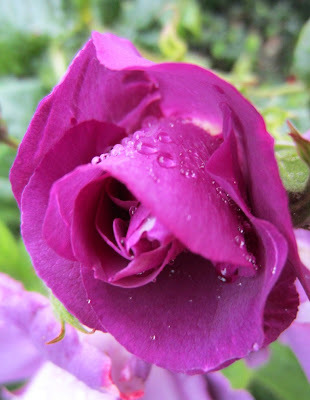 I don't have many roses in my garden, I've never been sure how/where to fit them in, and I'm hopeless about spraying them, so that the one I've had longest, 'Zepherine Drouhin' (which my father warned me is "a martyr to blackspot") is now a sorry shadow of its former self. But the rose in the picture is holding up well - it's 'Blue Moon' and I bought it from Helen Dillon a couple of summers ago. It's a lovely rose, looks a lot less pink in real life than it does in the picture. It's beautifully scented (and really, what is the point of a rose without fragrance?) and very forgiving. A bit of judicious pruning in March or so, keep an eye out for aphids, and the rest it does itself. So far. But I'll have to check out if it might benefit from the odd dose of organic feed. You know a blog/the web can do many things: bring you images (still and moving), words and sounds, but it can't bring you scent. So this week, I ask any of you who can to get out there and find some roses and then breathe in their delicious perfume. What could be lovelier? ... there must be honeysuckle. And just when I think the fragrance of roses is the best in the world and is the signature of summer, I'm arrested by the scent of honeysuckle. 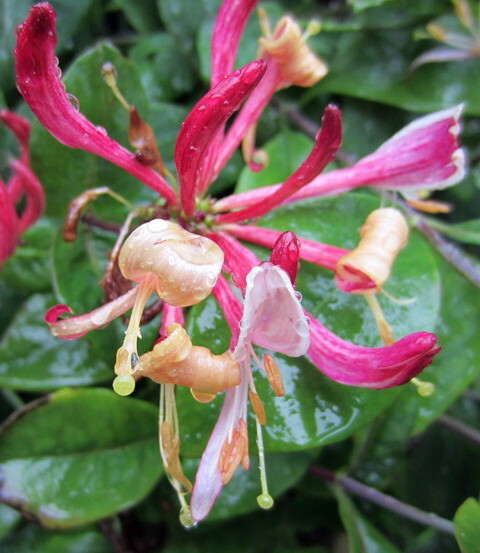 The wonderful thing about honeysuckle (or woodbine, Lonicera periclymenum) is you don't even have to get up close and personal. It wafts its scent out onto the evening air to attract moths, its main pollinators. Adapting to the moths, honeysuckle has long stamens and stigma, and a long throat of the flower itself (moths have a long proboscis that can reach to the nectar within). Mind you, the bees have a go too during the day. Have you ever been caught short by the smell of honeysuckle as you walked down a country road? The first time I really noticed this was when I was in Irish college in Béal Átha'n Ghaorthaidh/Ballingeary in west Cork, many years ago. The roads were lined with hedgerows, each with its own tangle of honeysuckle working its way up through bushes and trees to open its golden blossom which glowed in the evening sun. Walking from our house to the evening céilí we'd suddenly catch that scent - and it's never just where the blossom is, you always have to look for it. Wonderful. Close to Ballingeary is Gugán Barra/Gougane Barra, a beautiful place, with a strong spiritual feel. It would be hard to sum it up better than James Harpur does. The honeysuckle I grow is a garden variety, with deep pinks and reds on the closed buds, opening to the characteristic gold, and with dark green leaves. It's vigorous and not as susceptible to mildew as some other varieties. It fills the garden with scent in the evening, and I've planted it near the breakfast bench (gets the morning sun) as the scent lingers on into the morning. 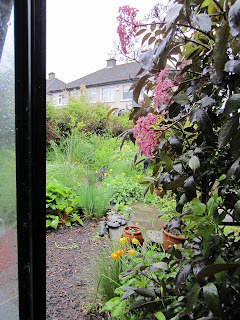 Well no, as it turns out, not in Ireland, not this summer... As I write this on Friday morning, it's raining steadily outside, it's about 12C, it has been raining all night and for much of yesterday. This summer is not shaping up well. A friend comments each summer about how "full" my garden is (I think he means crowded). And indeed it is, which is fine except on wet mornings such as this, where the obstacle course of very wet plants is a challenge on the way to the compost heap. Especially at the corner of the glasshouse where a beautiful dark elder reaches out its deep burgundy leaves to drench an unwary gardener. 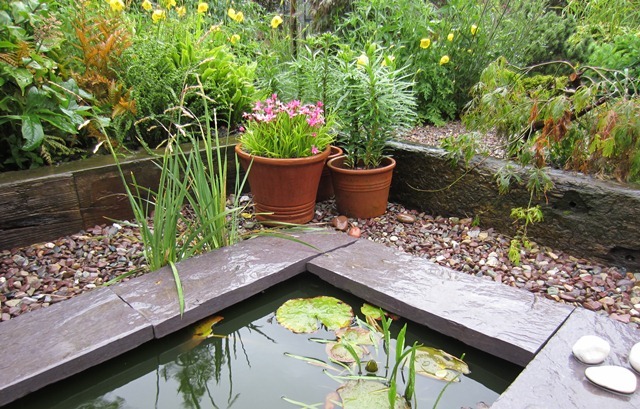 Well, all that rain isn't doing the pool any harm, and it shows off the Valentia Slate rather nicely. Sadly too, in this picture, the continuing damage to my lovely Japanese maple is clear to see. I mentioned it to a friend--and very gifted gardener--last week, and she suggested that it might be honey fungus. I'll have to take a closer look at the plant to see but if it is, that's not good news. So to end on a more positive note. I visited two gardens last weekend, both not far from where I live, both belonging to members of the Alpine Garden Society. Perfection abounded. 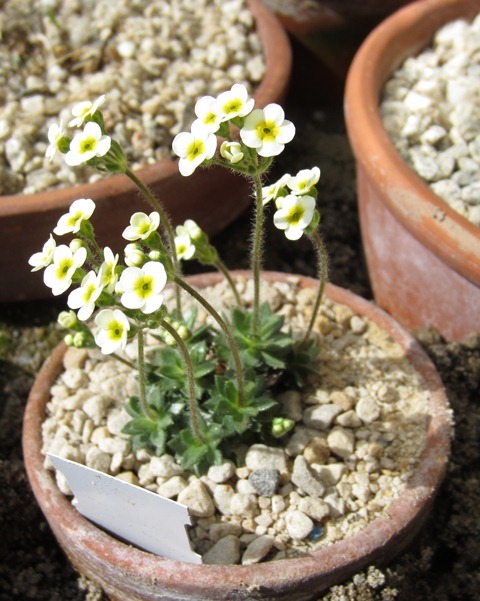 I don't think I have the patience to be a committed alpine gardener, raising beauties such as this tiny but perfectly formed Androsace. (The plant label in the pot gives you some idea of the scale). 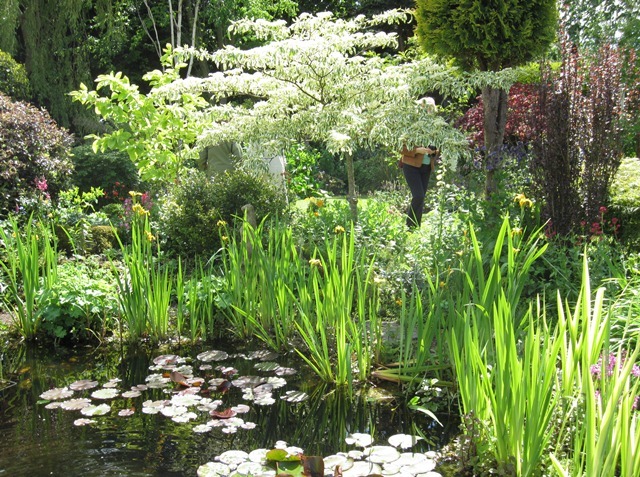 But I can marvel at them all the same, and at the sort of pool/pond I'd like to have in my garden if only I had more space! Lucky for me then that I have occasional visiting rights.